If you’ve been reading my randomness for awhile now you might have caught on to the fact that I kinda have a thing for porcupines. While it might not be one of those “contractually obligated” type of obsessions I have posted quite a few times on these adorable little guys. Like here, and here, and here and of course here. I especially love it when they’re talkers. And judging from the videos I find online quite a few of them are. So I was delighted when I stumbled across Kemosabe who can clearly talk up a storm. I’m guessing excitement over bananas helps in the chattiness department. Kemosabe lives at the Animal Wonders shelter in Montana. 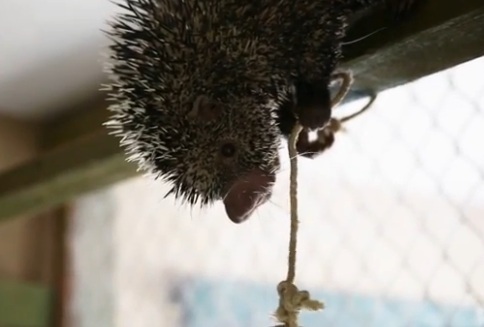 And now, as promised, (hold onto your hat) an explosion of porcupine adorableness… BAM!…. You’ve seen Teddy Bear the porcupine eat his corn right? Morning coffee break time…psst it involves porcupines!